See part I, Personality Traits as Potentia. A further difficulty I have encountered when talking about personality traits such as conscientiousness is their heritability. When I say that a personality trait like C is about 50% heritable, I am often greeted with unbelief. How can this be so? This is so because personality traits are natural, in the fullest sense of the word. By this, I mean that the traits of openness to experience, conscientiousness, extraversion, agreeableness, and neuroticism, are part of our shared human nature, and can be expected to have all the properties that implies. The first thing to do is define natural. This is hard, because it is an analogous name, with many different, but related meanings. What I mean by natural is what Aristotle and Aquinas meant: a nature is an inner source of activity that makes a thing to be what it is. The word comes from the Latin natus, to be born. The contrary of this is artificial, and by this I mean art as something created by means of the directive actions of a mind. Let us consider an example borrowed from Mike Flynn. The strength of our muscles is something we are all familiar with. It is clear that some people are stronger than others. But what is the source of these differences? You can be either naturally strong, or artificially strong. Consider that without the benefit of exercise, some people are simply larger and more powerful. Now clearly, the level of everyday activity that a person sees will influence how strong they are. Typically, a lumberjack is stronger than an accountant. But let us imagine we are dealing with people who do the same things, so that factor is held constant. The level of strength each person has will be determined by their individual nature, some more, some less. Now, if look at the art of exercise, we can increase our strength above our natural strength. Thus, by diligent application, the weaker can become stronger. However, if we again hold the level of activity constant, those with greater natural strength will probably end up stronger too, because there is more potential strength in their nature. This is not necessarily always so, but with human strength it seems to be so. So then, human strength is a combination of nature and art. For any given person, some amount will be natural, and some amount artificial. One way you can tell the difference between nature and art is that if you take away the art, nature will reassert itself. If you stop going to the gym, your strength will return to its natural level. Now, clearly, it is possible to cause natural strength to wither away too. But Aristotle's concept of nature overlaps with what we would call normal. If you deny a man food and space to move around in, as prisoners in a gulag perhaps, their natural strength will be diminished. But to speak of the natural always means to analyze what is needed for the nature to function, some minimum level of food and activity. To say that a thing is natural does not mean it operates like magic. So what does this mean for personality traits? If the OCEAN traits are natural, then that means that they are at least partly material, in the Aristotelian sense, which means that they can be heritable in the same way that any biological traits are. Thus we should not be surprised that children are like their parents in these traits. It also means that if you take away what people need to actualize these traits, they will suffer for it. In the case of g, nutrients like iron and iodine are important for brain development. Take them away during childhood, and a person will never be the same. Also, it means that these traits can be affected by art over and above their natural levels, but where you start influences where you end up. Consider Olympic weightlifting. How many gold medal weightlifters are petite, small-framed people? This is not to say that a 5 foot, 90 lb. 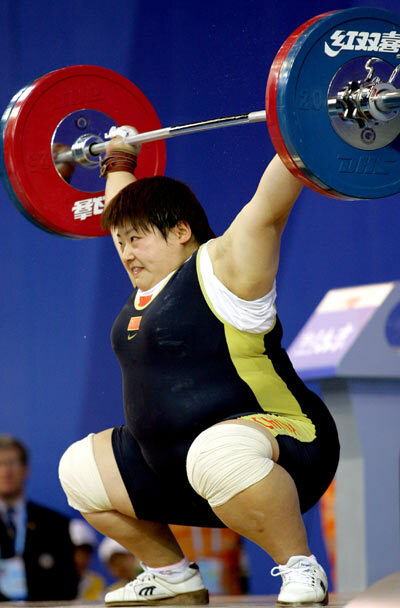 woman couldn't take up Olympic weightlifting. It is a powerful exercise for building strength. But, I doubt she'll be lifting 150kg no matter how hard she tries. Her nature lacks the potential for that. I'n not impugning the strength of Annie in the first picture. She is probably stronger than me. However, there is a clear difference between here and Huang Huan, gold medal winner at the Beijing Olympics. Huang has a much different build than Annie, and is probably naturally stronger. Then Huang built up her strength to truly amazing levels. Huang is both naturally and artificially strong. Personality traits are much the same. Different people are born (natus) with differing endowments of traits. It is pretty clear that lacking conscientiousness is generally a bad thing, in the same way that being weak and sickly is a bad thing. But, no trait of this kind is unaffected by what you do. This is what personal development is all about. Having low agreeableness does not have to mean you are rude. You can learn manners. It will be harder, and someone with low A will probably never be truly suave, but you can learn how to behave in such a way that social friction is decreased. Manners are the art by which we strengthen agreeableness. The objective with any kind of behavioral modification like this [Aristotle would have called it cultivation of the virtues] is to develop a habit to the point where it becomes literally a second nature, but experience will show that just like exercise, you need to keep it up or the first nature will have its revenge. If we turn to g, this is the explanation for the fadeout effects that are seen with any kind of intervention to raise intellectual ability. If you look at kids in Head Start, or anything like it, you will see a big effect at first, but if you look a few years later, you almost cannot tell any difference. Nature is reasserting itself, because after kids get out of Head Start, they are no longer performing the mental exercise that artificially raised their academic ability. Viewing personality traits as natural thus can help explain what we see. Conscientiousness really is heritable, but that does not mean you can't learn to straighten up your house and do things on time if you C is low. It does however mean it will probably be really hard. You literally have to work against your own nature. Someone with a high C will do those things easily, naturally. Just the same with g. It is entirely possible to raise IQ artificially, but if you stop the intervention, you will lose the effect. Unless of course, you know how to change the underlying nature. Which to the best of my knowledge, we do not. Lately, I've been thinking of personality traits such as those quantified by the OCEAN model. A major conceptual difficulty I run into when talking to people about these traits is their innate imprecision. For example, the Openness to Experience trait is correlated with political liberalism, but you probably don't have to look very far to find a counter-example of someone whose O is pretty low, but isn't in fact conservative at all. Or vice versa. This never bothers me, because I know of the inherent weaknesses of correlation. However, not all that many people think that way, so you are basically facing an uphill battle if you try to explain this phenomenon in those terms. I have thought of another way to explain it that is probably better for verbally oriented people, plus it has the benefit of 2500 years of historical usage. Traits such as O or g are Aristotelian potentia or δύναμις. I know, that's not simpler. What are potentia? The notions of act and potency are the foundations of Aristotle's Physics. Aristotle introduced these notions to explain how one thing could change into another. To put it simply, any actually [there's that word] existing thing is in act. It is something. But, it could also be something else. So Aristotle reasoned that it is potentially many other things. To put this in modern terms, we can think of mass-energy. We know that there is a relationship between stuff and energy, and that it is possible to convert one to the other under appropriate conditions. Energy is potentially matter, and matter is potentially energy. How does this relate to personality traits? I tend to think of personality traits as tendencies of greater or lesser strength. Openness to experience tends to be associated with political liberalism, it potentially can lead to political liberalism, but not always. It can potentially lead to other things as well. Note that I am positing a causal role, but not a determinate one. I see these as formal causes rather than efficient causes. Potentia, but their nature, are indeterminate. In the broadest sense, one thing can potentially be an infinite number of other things. This can be most clearly seen in the mass-energy example. Mass-energy can be any material thing whatsoever. It has the maximal amount of potency and the least amount of act of any material thing we know. But, it still has a little bit of act in it, because you cannot get something for nothing. There is a conservation law that tells you how much stuff you get from energy, or vice versa. It is not completely indeterminate, but rather indeterminate in a specific way. There are different kinds of potency. The canonical example is learning grammar. By nature of being human, we are all capable of learning grammar. However, there is a difference between knowing grammar, and using grammar. Even after you learn it, it is still in some sense potential grammar, if you aren't doing anything with it. But this is clearly different than when you don't know grammar at all. The knowledge is now usable at will. Some of the potency has been used up. so to speak. Before you could have learned any number of things, but now you know one thing, and can actually put it to use. Personality traits are much the same. There is a range of possibilities associated with each one, but they have a unifying theme that lets us group them together. They are partly act, and partly potency. The act determines the trend, the potency allows variety. The amount of the trait can vary. Some people have a lot of conscientiousness, and some have a little. If you have a lot, you can do lots of things with it, if you have a little, the potency is accordingly more limited, and you can do less with it. The psychometricians are on to this in regards to g. There are two components of g, gf and gc, representing fluid intelligence and crystallized intelligence. Fluid intelligence is pretty much raw problem solving ability. Crystallized intelligence is closer to what many people think of as education: vocabulary, experience, and factual knowledge. What is really interesting is how these change over time. Fluid intelligence peaks when you are young, and steadily declines. Crystallized intelligence grows more slowly, and only begins to decline late in life when aging truly sets in and memory and mental function begin to decline as well. declines continuously. It is naturally being used up all the time. is more stable, and in fact most all of us notably increase in experience over time, into gc, which is where the gf is going. Applying this to personality traits, one thing that mystifies some people about the OCEAN model is how vague it is. "What that supposed to be insightful?" I often hear. This is because we are really looking at potentia. There are lots of different kinds of personality traits that psychologists talk about. These five are the most general, the others tend to fall underneath the big five. Each of us actualizes the big five traits in different ways. We basically form our character over time by means of the things we do, turning potential traits into specific habits and dispositions. This is also why we become set in our ways over time. The potential got used up. This explanation is not simpler than the statistical one. However, it does unify all of these things in an interesting way, and it allows for a more complete explanation of how each of us experience the OCEAN traits. It is both causal, allowing us to make predictions about people and understand the world, and it is also not determinate, allowing us to understand the natural variation between people with similar levels of the same trait. It also explicitly ties the model into the Aristotelian tradition, which underlays most of Western thinking. Next up: personality traits as natural.